Scheffleras are very popular house plants that produce big dark or variegated palmate leaves (leaves made up of several smaller leaflets growing out of a single point). Hardy in USDA zones 9b through 11, they are often kept in pots indoors in colder areas. However, life indoors in a pot can be hard on a plant, and can often result in leggy, unhealthy looking shapes. That’s when it’s time to prune. 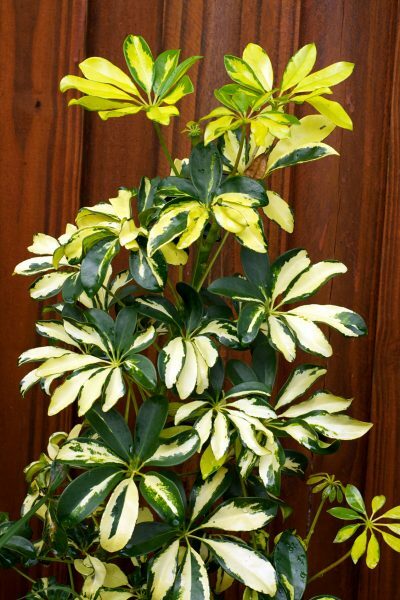 Keep reading to learn more about trimming schefflera houseplants and how to prune a schefflera. 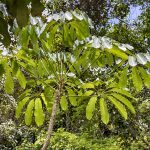 The tropical schefflera plant, also known as umbrella plant or tree, can grow quite large outdoors in the right climate. 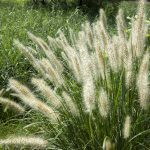 Indoors, this popular houseplant can be trimmed and maintained at a manageable size. Pruning schefflera plants is easy and nothing that should prevent you from enjoying this beautiful plant in your home. If you have ever seen a native schefflera outdoors, you may be surprised to find how large they grow. When given natural light, water, and space, they can grow to be 40 feet (12 meters) tall. Indoors, they will only grow to about 8 feet (2.5 meters). You can manage the height of your umbrella plant by trimming and shaping it. Pruning schefflera plants is not strictly necessary, but if you want a pretty umbrella shape and a certain height, or if your plant has gotten out of control, you can easily trim it. Scheffleras can have a single trunk, but they tend to have multiple stalks that branch off as the plant gets higher. If your plant isn’t getting enough light or nutrients, or if it’s just in too small of a pot, some of those stalks might get long and leggy. They might flop over under their own weight or produce leaves only at the ends. This is a good indication that it’s time for schefflera plant pruning. Pruning a schefflera plant is not especially hard – if you see a long and unhealthy looking stalk, cut it back! Cut any bad looking stalks down to 3 or 4 inches high. This should encourage new growth and make the plant more compact and dense. It may also help to move the plant to a sunnier window or transplant to a bigger pot. If you have just bought a schefflera from the nursery, it is probably 2 to 3 feet (about 1 meter) tall. As it grows, you can prune it to help maintain the shape you want and to prevent it from getting any taller than you want it to be. For indoor plants, this can be done at any time of year. Use a sharp pair of pruners or a knife and make cuts just above leaves. Make cuts to break up denser clumps and to make the plant appear more even. Strategically pruning a schefflera plant can encourage it to grow out as well as up and make for a denser, more bushy shape. Trimming schefflera houseplants can be achieved by cutting off the tops of the tallest stalks about an inch above the spot where the next leaf down is attached. This will encourage more growth outward from the stalk instead of upward. You can also prune your schefflera if it has gotten overgrown. Make cuts to shape it and to thin it out so that light can get in and stimulate leaf growth on any bare branches. If you have a “leggy” stem, or a main stem that lacks leaf growth, you can cut it back to about six inches (5 cm.). It may seem severe, but this stem’s growth will catch up to any others. The reason it went bare may be lack of light. 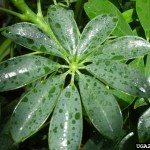 Be sure your umbrella plant is in a spot where it gets a lot of indirect light. Rotate it occasionally to even out leaf growth. Read more articles about Schefflera Plants.